Suzanne R. Engelman, Ph.D., is a Psychologist offering individual adult therapy for stress management, coping with medical illness, health related challenges, death and dying, grief and bereavement, anxiety, depression, bio-feedback, pain-management, animal assisted therapy, individual and couple's therapy. 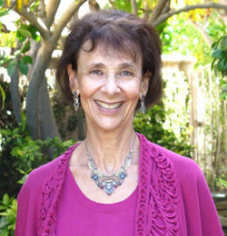 Psychologist Suzanne R. Engelman, Ph.D., located in Laguna Niguel, California, provides psychotherapy services for individuals, couples and families. With a Jungian and MINDFULNESS-based orientation, I incorporate mind/body specialties, and animal assisted therapy. I offer opportunities to use biofeedback, stress management skill training, visualization/dream work and diaphragmatic breathing. This may help you manage your life concerns and move forward with greater meaning and integration, and reduced anxiety and depression. Increase your resilience, decrease stress, reduce your emotional and physical discomfort and pain, and move into the present feeling more balance between your mind, body and spirit. The emotional and spiritual aspects of medical problems such as cancer, high blood pressure, recurrent abdominal pain, irritable bowel syndrome, headaches, bodily tension, Tension Myostitis Syndrome (TMS), fibromyalgia, and CRPS. I offer a safe, inviting and respectful space for individuals, couples and families to explore their current issues and problems. I consider you the expert about your life and I am a consultant in helping you explore meanings, behaviors, and obtain answers to your questions. When you or a loved one are experiencing the stress of life--be it work or home; or the stress of your own medical problems or those of a loved one who may be approaching the end of life, it can be helpful to work with someone like myself. I have advanced training in stress management tools; bio-feedback; pain management strategies; and death, dying and bereavement in addition to mind/body strategies including diaphragmatic breathing. Care-giver stress and relationship stress can also be addressed in our work. I conduct my sessions with the assistance of my very cute Pet Partners trained therapy dogs, Lizzy, a small white bischon, and CJ, a standard poodle. I am a member of the medical staff's of St Joseph Hospital in Orange, and Mission Hospital and Mission Laguna Hospital in South Orange County. New patients should start with my For Patients page on this website. Other States of Consciousness --End of Life Dreams, Death Bed Visions, and Terminal Lucidity are all spiritual doorways into self-transcendence, i.e. to our being with an essence, beyond the separateness of the ego we know from day-to-day living. or go to the emergency room.